The McDonald Distinguished Scholar Lecture on Christian Scholarship, "Christianity and Human Flourishing: The Role of Law and Politics," is available as a webcast. 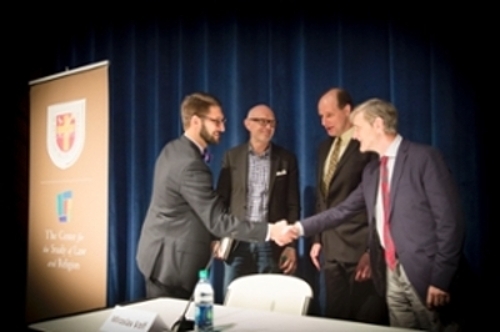 This lecture features David Hempton, Alonzo L. McDonald Family Professor of Evangelical Theological Studies, John Lord O'Brian Professor of Divinity and Dean of Harvard Divinity School; and Miroslav Volf, Henry B. Wright Professor of Theology at Yale Divinity School, Founder and Director of the Yale Center for Faith and Culture. This is the third in a five-year series, hosted by the McDonald Agape Foundation and the Center for the Study of Law and Religion at Emory University. The McDonald Distinguished Scholar Lecture on Christian Scholarship, "Christianity and Human Flourishing: The Role of Law and Politics," is available as a webcast. View the lecture on YouTube.